Why is Old York Road — a Native American trail and the main route that connected Philadelphia to New York City during Colonial times — located where it is? Why are the streets of Clinton laid out as they are? Why did north Hunterdon County see so little activity during the American Revolution? The answers to those questions lurk beneath the surface — literally. John Allen digs deep to explore the surprising role geology plays in our county’s history and development. The presentation begins in our wagon house at 10:30 a.m.
We see examples every day of how our geology impacts our lives whether it’s through the roads we travel or the names of the places we visit. For instance, evidence of the misguided belief in the mid-1800s that a large quantity of copper existed near Flemington can be spotted easily. “Mine Street, the Coppermine Apartments, Mine Brook, Copper Hill — these are just a few examples,” Allen said. Copper mining companies came to the area and sold all sorts of stocks, but their dreams of riches never panned out. The earth beneath Hunterdon County holds iron ore that once fueled the forges during the American Revolution, and in the 19th century carbonite rocks fed the numerous lime kilns that sprang up in the northern reaches of the county. The county also has rocks best known for architectural use, such as “brownstone”– New Jersey’s unofficial state rock — and “trap rock,” which is still actively quarried and used by the state for roadways, railroads and garden landscaping, Allen noted. Allen earned his bachelor’s degree from the University of Connecticut and a master’s from Rutgers University, both in geology. After 34 years as a petroleum geologist, and living on three continents, he retired in 2013. 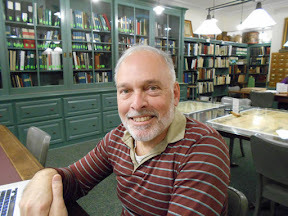 He fills his time researching denizens of the area’s cemeteries, reading historical literature, and studying the impact of New Jersey’s geological history on the development of the Garden State. He’s a member of the board of trustees of the Hunterdon County Historical Society and a member of East Amwell’s Historical Society and Historic Preservation Committee. This presentation is free. Reservations are suggested by calling us at 908-237-4582 or emailing Judy@hunterdonlandtrust.org. And, here’s this week’s Jersey Fresh Availability Report. We’ve got a deal for you that’s both sweet and hot! This week’s Land Trust Special lets you save 25% on sweet or hot Italian sausage from the Milford Farms stand. Milford Farms is a fourth generation farm started by Charles Kolvites in 1928 in Kingwood, and it’s currently owned by his great grandson, Scott Milford and his wife Mayann. The farm breeds its own beef cattle and pigs, and grows the grass hay and grain that the animals are fed. Visit the HLT boot to pick up your coupon. If you wish to become a Land Trust Supporter and get great deals like this for an entire year, please stop by the booth and chat with a volunteer. — Combine all the ingredients for the meatballs thoroughly. Wet your hands, then form them into golf ball sized balls. — Heat a 4 quart Dutch oven over medium high heat. Melt the coconut oil, and once it is hot, add the meatballs. Cook them for 30 to 45 seconds on each side until they are browned. Remove from the pan. — Add the onions, garlic, lemongrass and chili to the pan and cook for 3 to 5 minutes. Add the meatballs back in, add the coconut milk and water. Cover and simmer for 5 more minutes before adding the broccoli. — Once the broccoli is crisp tender, carefully fold in the zucchini noodles and allow them to cook until they are bright green and just tender. Salt to taste. Serve with a garnish of cilantro and lime. The Back Porch Jugband premieres at our market. It features Gary P. Cohen, John LaSala and Mark Toman, who specialize in the good-time sound of old-fashioned country, blues, & folk music, played on a mix of traditional and home-made instruments. The Back Porch Jugband evokes the energetic and informal sounds of early Memphis and country blues played on guitar, Dobro, banjo, mandolin, washtub bass, bowed Psaltery ukulele, kazoo, jug and even a musical saw. Join us at the Dvoor Farm, 111 Mine St. in Raritan Township from 9 a.m. to 1 p.m.